The U.S. and Russia are inching toward a serious confrontation over the U.S.-led coup of the Ukrainian Government and Russia's move to protect its interests in Crimea, millions of people in this country struggle to make ends meet and Barack and Joe decide to take their families on a warm-water vacation. It doesn't really matter because Obama and Biden are nothing but figureheads who represent the extremely wealthy corporate and individual interests which paid for their election. Those are the real players behind the scenes. They use Obama to sign the Executive Orders which enact the policies designed to make the real players even richer - at the taxpayer's expense, of course. Notice how Biden has been mysteriously silent on the Ukraine situation? The White House can't afford the risk that Biden says something completely stupid, or "off-teleprompter," so I'm sure he was instructed to disappear. Obama has volunteered to stay away from Democratic incumbent campaigns because of his poor approval ratings, so he's pretty much dead weight until his term expires. I guess the only problem I have with letting Obama and Biden go on perma-vacation is that the wealthy elitists should be funding their vacations and not the taxpayers. I encourage everyone to read that brief interview with Richard Russell. As I discussed yesterday, we know the Government is lying through its teeth to us about the Ukraine situation. It's amazing how quickly CNN and Fox News seem to have misplaced the Victoria Nuland phone tape discussing the $5 billion the U.S. has "invested" to foment the unrest over there. You know, the one in which she says "F_CK the EU." Both CNN and Fox are disseminating nothing but the lies being promoted by Obama/Kerry etc without researching or reporting on the actual facts. Kind of ironic that CNN backs the Obama regime's backing of the neo-Nazis who have taken control of western Ukraine (I'm not surprised that Fox News supports this). The Government also lies about the employment situation in this country. We saw the most recent example today with the Bureau of Labor Statistics monthly employment report claiming that the economy generated 175,000 jobs in February. I don't want to go through a detailed analysis of the data as reported and the obvious statistical manipulation implemented on that data. The real issue is the legitimacy of the data itself. This requires thinking about the data as presented in the context of every other business data report that was released during February, especially the reports from the private sector. As one example, the BLS claims that the construction industry added a total of 55,000 jobs in January and February. Yet, we know from homebuilder reports that housing starts have been tanking. And what about the "bad weather" narrative. If housing starts declined over the period and bad weather prevented this, how on earth is it possible that profit-seeking businesses hired workers? Does anyone really think that a homebuilder executive, who is trying to keep his stock price elevated so he can unload as many shares as possible (see the recent S-4 SEC stock transaction filings - homebuilder execs dumped shares in February), would spend money hiring workers who don't have to work? That's just one line item example. There are several. The point here is that if you look at the numbers being reported - regardless of how they are manipulated to paint a positive picture - in the context of everything else that has been reported about the economy, there's no possible way that the economy generated job growth in February. In fact, the ill-reputed "birth/death" model, which everyone understands is used as "plug" number the Government uses to pad the employment data, explains 125,000 of the 175,000 jobs reported. The birth/death model has been dissected and shown to be a complete fraud ad nauseum. The most frightening part about all of this the fact that the Government finds it acceptable to lie to us about everything. The U.S. Government has become as corrupted and self-serving as was the old U.S.S.R Government that many of us grew up fearing. The lack of fear about what has happened in our own backyard is truly stunning. Before I elaborate on the above a quote with a few salient passages from PCR's brilliant analysis and commentary on the situation in Ukraine, I want to clarify for anyone reading this that the U.S. has funded and militarily supported a political regime in western Ukraine that has ingrained political and military roots with Hitler's Nazi Party. This is an undisputable fact. If you decide to fall for the Orwellian rhetoric flooding all of the U.S. news outlets, you are doing so out of complete ignorance of the facts. In working with Dr. Roberts on several collaborative articles about the U.S. Government's long term and massive intervention in the gold market, I have come to appreciate the deep insight and understanding he has for what is really happening behind "the curtain" in DC. His ability to communicate and elucidate this reality is nothing short of brilliant. His latest article on the truth about what is happening in Ukraine and why the U.S. has fomented political and civil chaos over there is a must-read for anyone who seeks the truth. Keep in mind that throughout history, the most definitive sign that a great Empire is in the latter stages of collapse is wantonly corrupted and reckless imperialism - of which we've seen many examples since Bush and Obama took office. In a mainstream media disclosure that took the gold investment world by surprise, Bloomberg published a report - Article Link - last week which contained data from an academic study that showed that the daily London gold price fixing has been manipulated for at least 10 years. While this is not new information to many precious metals investors, it is the first time that an establishment news outlet has exposed the truth about the widespread and blatant Government-sponsored manipulation of the precious metals market. It should be noted that the Financial Times also published this report but then retracted and deleted the article. The London daily gold fix is an event that has been setting the price of gold twice a day since 1919. With the advent of computerized market trading and the gold/silver futures market (1974), it would appear that the London fix is no longer necessary as a mechanism of "price discovery." As we will see, the London fix still exists because it is used by the bullion banks as an overt market manipulation mechanism. The price "fixing" is conducted by 5 individuals who work for their respective bullion banks. These individuals jointly decide what the "spot" price of gold should be twice a day, once in the morning and once in the afternoon (London time). They committee is allowed to communicate with market participants and their respective banks are permitted to continue trading gold and gold derivatives while these individuals decide what the price of gold should be. Theoretically this price as "fixed" is determined to be the price which will clear the market of all buy and sell orders up to that point. Theoretically, it provides a "benchmark" price for the spot price of gold. Incredibly, the time of fix occurs during the period of time when the Shanghai Gold Exchange, the largest physical gold market in the world, is closed for the day. But how can a closed system like this possibly operate objectively? The gold fix system is inherently ingrained with the conflict of interest and moral hazard the accompanies any system governed by collective "judgment." The Bloomberg News article details a study done by NYU professors which showed that between 2004 and 2013 large price moves during the afternoon "fix" were moves lower at least 66% of the time. In 2010, the large moves were negative 92% of the time. From their work, the authors concluded that the market in all probability was manipulated by the banks whose representatives establish the price fix every day: "There’s no obvious explanation as to why the patterns began in 2004, why they were more prevalent in the afternoon fixing, and why price moves tended to be downwards" - Rosa Abrantes-Metz, one of the authors of the study. As it turns out, Ross Norman, CEO of the well-known London-based Sharps Pixley bullion retailer issued a rebuttal to the Bloomberg article and in defense of the London fix (LINK). Ironically, in his attempted defense of the gold fix process, Norman inadvertently exposes the system's inherent flaws, thereby showing the reader how the London fix committee can easily manipulate the market. In fact nearly every point of assertion about, and defense of, the London fix process is embedded with half-truths or outright lies. In response to the fact that there are unusually large moves during the "fix" period, Norman explains: "the fix is a price discovery process and as such large buying and selling orders collide here - large moves are therefore to be expected. In fact, the mere fact that it does move confirms some differences in opinion over fair value between the clients dealing in the fix - actually it supports the notion of the integrity of the process." This explanation is is patently disingenuous. Gold trades in either physical form or derivatives form (futures, forward) nearly continuously during the trading week. The "price discovery" process occurs inherently with every buy/sell transaction. To say that it is only at the time around the p.m. London fix that large orders to buy and sell constitute "price discovery" is entirely misleading. In a continuously functioning market, orders of all sizes are executed and "price discovery" occurs with each trade execution. A committee of five individuals is not needed and collective "judgment" about what the price should be is not required. In his second point of defense of the London fix, Norman makes these comments: "the fix is used by official institutions (like Central Banks) and many major miners who all require an "objective" and published price because they need to [be] more accountable than say (sic) a proprietary trader. The spot price for example is neither of objective (sic) nor published. Selling by miners in size every day and invariably outweighs (sic) any official buying which is typically large but infrequent. Hedging or financing for the miners have will often (sic) link their financial arrangements to the gold fix." Just as a note, it's interesting that Norman decided to put quotes around the word "objective." Clearly the London fix is anything but "objective," since by it's very nature it defies the objectivity and price discovery mechanism of a continuously functioning market. I'm not sure why a "fixed" price needs to be "published" at all. At any given time during the 23 hour trading period of each business day gold trades in either physical or derivative form (futures, forwards). Anyone can go online and "discover" the current trading price of gold. To be perfectly clear about this, any price which is determined in the market by a buyer and seller is inherently more objective and visible than is a price which is "fixed" by a committee of five individuals saddled with inherent conflict of interest. Mining companies and Central Banks are free to use the standard market mechanisms to execute their trades. To say that a committee operating out of view of the market can determine an official "spot" price is either unintentionally disingenuous or an outright lie. If anything, the London fix process prevents the true price discovery process of an open and free market. Norman also claims the London fix conference call is not private and is open to clients. Do you have access to this call? Our firm does not. I don't know of anyone who has access to this call. While the price fix committee of five may have information about the large buy and sell orders that are about to "collide" - to use Norman's term - the market as a whole does not. An efficient market functions most efficiently in its price discovery process when as much information as possible about buyers, sellers and size is immediately disseminated to the entire market. The London price fix system not only prohibits the dissemination of information that might help the market achieve its price discovery goals, it leaves the discretion as to the "best" market clearing price at that point in time up to the committee of five who may or may not be on the phone with their best preferred LBMA member clients or their own banks. Again, to reemphasize this point because it can not be emphasized enough, the price fix committee members have de facto conflict of interest by the very fact that the banks they work for have large capital positions in gold and silver. Furthermore, while detailed LBMA position data is not made available to the public, we know that these banks run large net short positions on the NY Comex. To say the least, the banks have a motivated interest to see a lower price fix every day. Norman next tries to defend against the findings of the study that the price of gold at time of the p.m. fix is fixed lower a majority of the time - with the statistical evidence overwhelmingly in support of this conclusion - by explaining that if London gold dealers (i.e. the bullion banks) "had consistently shorted gold as maintained" they would have suffered massive losses. This assertion is absurd because it assumes that the big bullion banks are always long gold. Yet, we know from over a decade of Comex data that the big bullion banks have run massive short positions in Comex gold futures. We don't know whether the big banks are net long or net short on the LBMA because the LBMA does not publish enough information about the big bank forward contract and bullion positions. In fact, from the size of the historical net short position of the big banks on the Comex, and the accompanying trading turnover of these positions, any bank with access to information about the level of the price fix before the general market sees it has the ability to net rapid and riskless trading gains on a daily basis. Finally, Norman tries to deflect the issue entirely by opining on the "vested interest" of Bloomberg in publishing this article and ends by scolding the organization ("shame on you...for lack of journalistic discretion and judgment...and failure to ask the right questions"). As Norman tolls this bell of scorn and disdain for Bloomberg News, ironically he's ringing it at himself, as Norman's disingenuous defense of the LBMA gold price fix surreptitiously exposes the reasons why the gold fix process is highly flawed. Indeed, it is a system of price determination which is susceptible to the moral hazard and market misconduct which accompany any market system in which price level is determined by a small committee individuals, all of whom have a high level of inherent conflict of interest. One last point, Norman is correct that Bloomberg fails to ask the right questions. Here's a small sampling of the right questions: 1) Given that the gold market trades nearly continuously during the business week, either by auction or computer, why is the London fix needed at all? 2) Why does the fix occur after the Shanghai Gold Exchange, the worlds largest physical bullion market, has closed for the day? 3) Why are the members of the price fix committee allowed to be representatives of the big bullion banks? 4) if #2 is unavoidable, shouldn't the members be from organizations which do not run capital positions in gold and silver or stand to benefit from inside knowledge about the price fix? 5) Why doesn't the LBMA publish more specific and detailed data about the forward contract and bullion positions of its member banks? Did Russia Just Flash The Global "Trump" Card Some Countries Hold? "We hold a decent amount of treasury bonds – more than $200 billion – and if the United States dares to freeze accounts of Russian businesses and citizens, we can no longer view America as a reliable partner,” he said. “We will encourage everybody to dump US Treasury bonds, get rid of dollars as an unreliable currency and leave the US market." Many of us have been wondering when one the of the large holders of U.S. Treasuries was going to brandish a freshly sharpened sword and threaten to swing it at the Achilles' Heel of the United States. While I highly doubt that Russia will actually dump Treasuries as a form of financial war against the U.S. - at least this time - the Putin advisor just made it clear that several powerful countries, with interests that often conflict with U.S. imperialistic behavior, hold a weapon of defense that is the equivalent of a financial nuclear bomb. What's most fascinating about watching the Ukraine events unfold is the shamelessness with which the U.S. attempts to impose its will on Russia for defending its own interests, and yet the U.S. wantonly goes into countries like Iraq and Libya, assassinates the leader, overthrows the Government and installs its own puppet. It's truly amazing, if not utterly Orwellian, the way in which the major U.S. media outlets have conveniently forgotten about the Victoria Nuland tape that Russia released discussing the U.S. role in destabilizing Ukraine in the first place. The biggest problem for the U.S. is that, despite the progressively fraudulent Government reports to the contrary, the U.S is spending far more everyday to keep the lights on than it takes in to cover those expenses. Watch this year as the spending deficit increases dramatically. We'll soon understand why the Obama Government pushed so hard to remove entirely the debt ceiling limit. Unfortunately, it is becoming increasingly apparent to anyone who examines the facts which belie U.S. Government pomp and circumstance that, short of unleashing nuclear weapons, the U.S. is only capable of bringing knives to a gunfight. Is Larry Yun Intentionally Making A Joke Out Of The Bad Housing Data? But the most brilliant propagandist technique will yield no success unless one fundamental principle is borne in mind constantly and with unflagging attention. It must confine itself to a few points and repeat them over and over. Here, as so often in this world, persistence is the first and most important requirement for success. - Adolph Hitler, "Mein Kampf"
Seriously, is National Association of Realtors chief economist, Larry Yun, trying to make a joke out of using the "bad weather" excuse for poor housing market sales? As I have shown repeatedly, the poor housing market sales results are a direct result, for many fundamental reasons, of the demand-side of the market falling away. In fact, RealtyTrac just released a report yesterday that showed institutional investor purchases of homes fell to its lowest level in January since March 2012: LINK That has nothing to do with the weather in any part of the country. However, I have provided links in previous articles that show that, on average across the country, the weather during January was about the same as it has been over the last 10 years. In fact, in California it was warmer than normal. 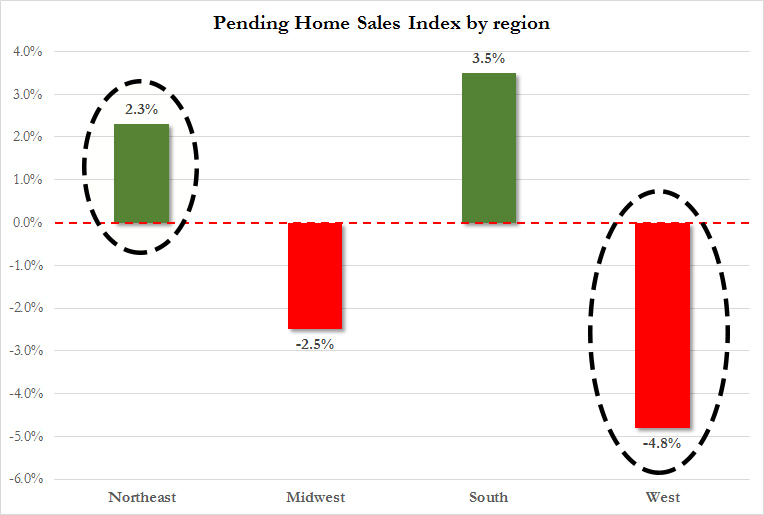 So why is Larry Yun insistent upon shoving the "bad weather" narrative down our throats every time the NAR releases a negative housing market report. For instance, just today, the NAR released its Pending Home Sales index for January. It actually showed a slight uptick for January from December but was below what was expected by analysts. So what does Larry have to say: "Ongoing disruptive weather patterns in much of the U.S. inhibited home shopping" (LINK). Now, from what we know about the weather patterns across the country, California/the West was warmer than normal, the Northeast and the South were about average with a few extreme bad weather days and the Midwest was also about average with some unusually cold days sprinkled in. So how come the biggest drop in pending home sales occurred in the area where the weather was warmer than usual and the areas that might have been affected by the weather show gains for January? The only conclusion I can draw is one of three possibilities: 1) Larry is tragically stupid; 2) Larry is a pathological liar; or 3) Larry is making a joke out of the fact that the housing market is beginning to collapse. Larry, if you happen to see this, please either leave a comment or respond with your explanation to my email as to why your statement about the weather is so obviously wrong. I encourage everyone to send this blog post to the NAR and maybe they can issue an explanation other than putting out the above blueprint from "Mein Kampf."